Day 4 of Climate week is about the use of paper and whether it is really worthwhile? Can we do without it? Do we use more than we need to, especially as we are entering an age when everything is done digitally? We all get bills sent through the post on a weekly basis, but it is necessary for us to receive it all through the post? 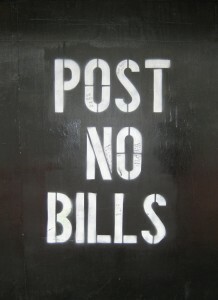 A lot of companies nowadays are turning to the internet to display bills. For example, I no longer receive bank statements from HSBC as you can log in online. It’s simple to do, you have a unique user code, then you are asked for your date of birth and a secret password. 3 simple steps to then manage your money online! You can check your spending, your bank balance, even check and create direct debits at the click of a button. That’s just stage 1 of making the postman’s job easier. Stage 2 should be your car insurance and tax. These can now both be done online too! Obviously, we are constantly being bombarded with adverts from insurance comparison websites on TV and they do work. Since passing my driving test I have used the internet as the easiest way to find the cheapest insurance deal. I am insured with swiftcover.com who do not send you post, instead you have a login similar to HSBC where you sign in and can access your car insurance plan that way. You can then print the documents you need to tax your car at the post office, or you could use stage 3. Stage 3 is getting your tax disk sent to you online. Ok, it doesn’t solve not using paper at all, but if you order it online you will save your petrol if you had to go to the Post Office, plus you keep the posty in a job! My point is you can do a lot of billing online nowadays. The internet has opened a new scope into how we do our daily chores such as shopping, billing and insurance as it can all be done online. It is time to get computer savvy and start saving a few trees by doing so! You don’t need a phonebook anymore either as most places are online! If we did all our bills online we could save 18.5 million trees a year, 2.2 billion tons of CO2 and 770 million kilograms of solid waste! However, it is not just billing that is being done electronically to save paper. Oh no, airports will sooner or later only accept e-tickets as a paper ticket in America has been costed at about $10 to produce, whereas an e-ticket will cost $1. When this rolls out across airports it won’t be too long before it is installed into football grounds and festivals. Train stations already have the Oyster card in the UK which you simply top up when you need it and swipe it over a machine in the station. Easy to use and economically friendly! This one is easy to incorporate into our daily lives, so I think we should all try to do our bills electronically and reduce the damage to our environment. Anglian Home Improvements raising the standards since 1966. Visit the Anglian website for information on our energy efficient products.